The most commonly cited measure of a population's agedness is the old-age dependency ratio, namely the number of people aged 65+ for every person aged 16-64. In previous posts, I have examined how this measure is expected to change in the US and UK, respectively. However, changes in ratios can often be difficult to interpret. An alternative measure of agedness is simply the percentage of the population aged 65+. This is plotted below for eight major Western countries over the the period 1950-2050. Data are from the UN World Population Prospects; figures for 2015-2050 are based on the medium fertility scenario. Overall, the percentage age 65+ is projected to rise by approximately 10 percentage points between now and 2050, meaning that, by 2050, more than one in four adults will be older than age 65. 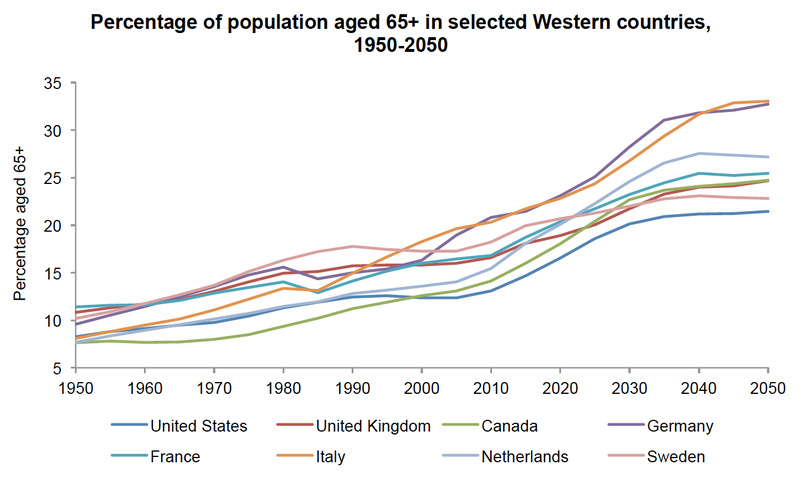 In Germany and Italy, as many as one in three adults will be older than age 65. Some have argued that these changes will place an increasing burden on social welfare systems, particularly healthcare and pensions. However, an interesting countervailing perspective has been advanced by two demographers in the BMJ. They suggest looking not at the number of people aged 65+ but at the number of people with life expectancy less than or equal to 15 years. Their suggestion follows from the idea that healthcare costs are accrued mainly in the last 10-15 years of life, rather than simply the years of life after aged 65. Using data from the ONS, they show that the percentage of people in England and Wales with life expectancy less than or equal to 15 years is projected to be more or less flat up to 2050. This implies that the increasing agedness of Western populations may not present such a burden for social welfare systems after all. As at least one commenter on the article has pointed out, however, state pensions ages will still need to be raised considerably in order for pension systems not to be overwhelmed. Indeed, the ONS recently reported unfunded pension liabilities in the UK of at least £4.7 trillion (over 320% of GDP). Follow-up on small businesses in the U.S. In the United States, a small business is a defined as an independent business with fewer than 500 employees. Small businesses account for more than 99% of all businesses, and about 49% of total private sector employment. There are approximately 28.2 million small businesses in the country, compared to just 18,000 large businesses. Each year since 2012, Thumbtack (in conjunction with the Kauffman Foundation) has surveyed more than 12,000 small business owners across the U.S. Results from the 2014 survey were released a few days ago. The Thumbtack sample appears to be reasonably representative, though it does oversample service sector businesses (as opposed to those in the agriculture and manufacturing sectors), new businesses (those that have been around for less than 2 years), and very small businesses (those with fewer than 5 employees). Overall, the survey comprises around 20 questions pertaining to the ease of doing business in the particular respondent's state. There are four main questions. 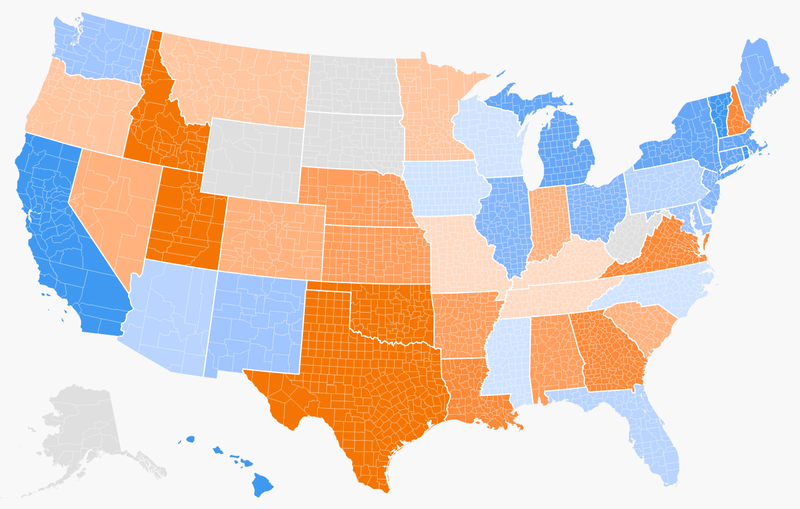 First, "In general, how would you rate your state's support of small business owners?" Second, "How difficult or easy do you think it is to start a business where you live?" Third, "How much does it cost to hire a new employee in addition to their salary?" And fourth, "How friendly or unfriendly is your state or local government with regard to business regulations generally? Thumbtack has aggregated the responses to each question at the state level, and produced heat maps documenting spatial variation in the perceived ease of doing business. The maps corresponding to the four preceding questions are all highly similar. The map below corresponds to the first question for the year 2012. 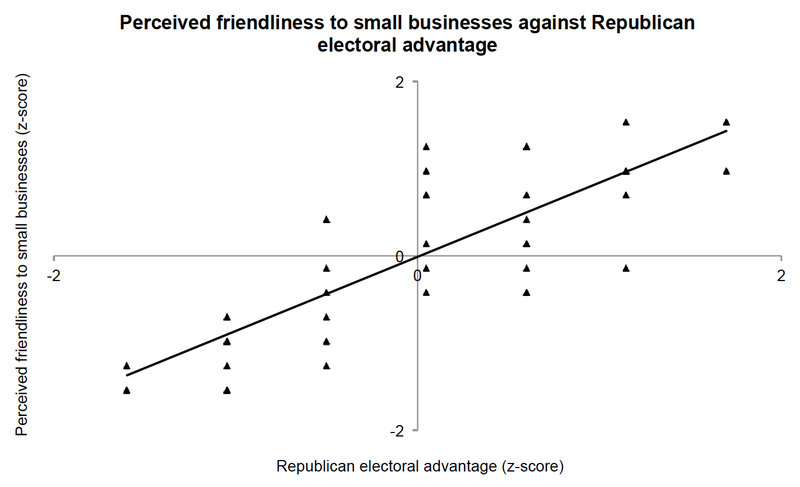 Interpretation is as follows: the more orange the state, the higher the perceived friendliness to small businesses; the bluer the state, the lower the perceived friendliness to small businesses; grey states were not surveyed. What is striking, though perhaps not surprising, is how closely this map matches the heat map of party vote shares, which is reproduced beneath it. 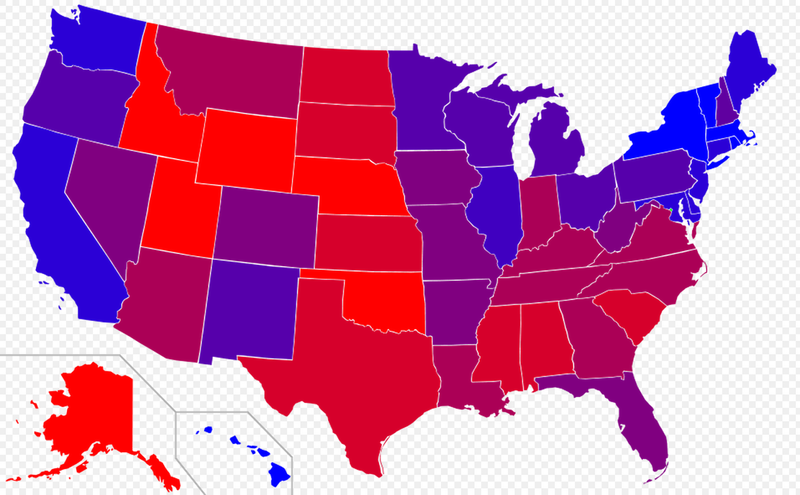 Here, the redder the state, the higher the average margin of victory for the Republican candidate over the 5 presidential elections between 1992-2008; the bluer the state, the higher the average margin of victory for the Democratic candidate. 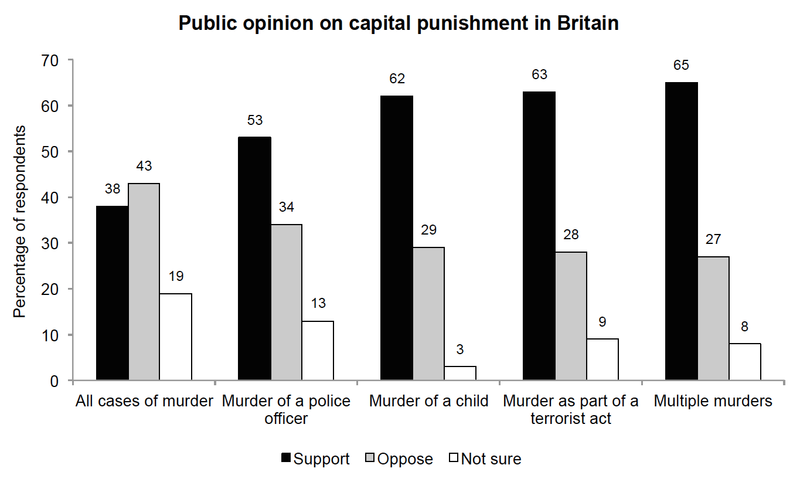 What does the British public think about capital punishment? A majority of US states still use capital punishment for certain crimes. It is not surprising, therefore, that a majority of Americans still support capital punishment for murder. Notably however, support for capital punishment in the US has been in decline since the mid-1990s. The graph below documents public opinion on capital punishment in Britain. The figures are taken from a 2011 YouGov poll, which to my knowledge is the most recent poll on the issue. A minority of British people, only 38 percent, support capital punishment for all cases of murder. However, a majority support capital punishment for murder of a police officer, murder of a child, murder as part of a terrorist act, and multiple murders. Indeed, a full 65 percent of people support capital punishment for the latter offence. Does the fact that capital punishment has been completely abolished in Britain therefore imply that we do not have a democratic society? Possibly. But there are of course important limits to the democratic mechanism, which is why many countries have constitutions that safeguard their citizens' fundamental rights. As (among others) Milton Friedman noted, "There is nobody who believes that if 51 percent of the people should vote to shoot the other 49 percent, that that would make it okay." The net impact of UKIP's rise on the Conservatives, at least in the European election, appears to have been negative. But there is at least one pathway through which UKIP's rise might have had, and might continue to have, a positive impact on the Conservatives. Many individuals who are liberal on social issues like gay marriage and abortion but take a centre-right position on the economy have traditionally voted for the Lib Dems. Despite being slightly closer to the Conservatives on economic policy, such individuals may have opted to vote Lib Dem for the reason Theresa May mentioned in 2002, namely that they did not wish to be associated with the "Nasty Party". However, now that UKIP is widely regarded as the "Nasty Party", and with socially liberal Conservatives such as David Cameron and George Osborne in prominent positions, many of these individuals may end up defecting to the Conservatives. Does opposition to immigration vary by migrant group? How would you vote in a referendum to reduce net immigration to zero, so that the number of immigrants settling in Britain each year is no more than the number of Britons leaving this country to settle abroad? A full 69% of respondents said that they would support a policy of reducing net immigration to zero, while only 21% said that they would oppose such a policy. The latest data from the British Social Attitudes survey bolster this finding. As the Oxford Migration Observatory notes, "approximately 3/4 of British people favour reducing immigration, on most recent polls and surveys." Overall then, opposition to immigration is considerable. But does it vary depending on which migrant group is under consideration? Thinking about different types of people who want to come and live in the UK, to what extent should the following groups of people be allowed to come and live in Britain? The groups under consideration were sevenfold, but here I examine just four: low-skilled migrants, asylum seekers, high-skilled migrants and wealthy investors. 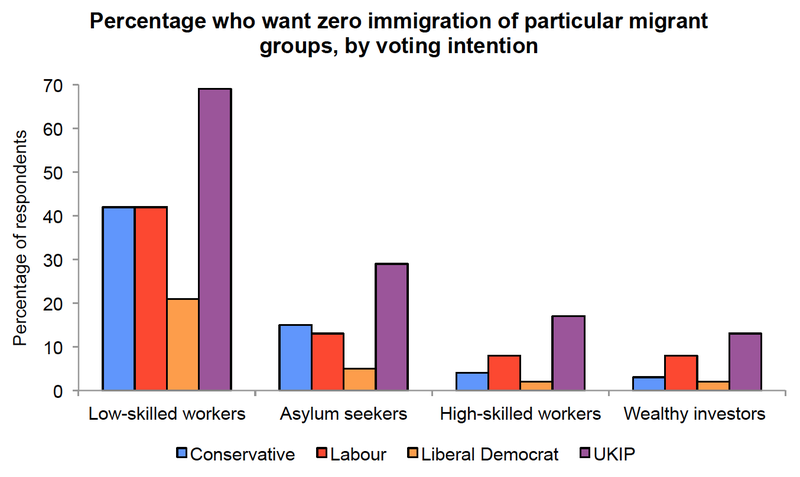 The first chart below displays the percentage of respondents who want less or zero immigration of each migrant group, broken down by voting intention; the second chart displays the percentage who want zero immigration of each group, again broken down by voting intention. A couple of interesting conclusions can be drawn from the two charts. 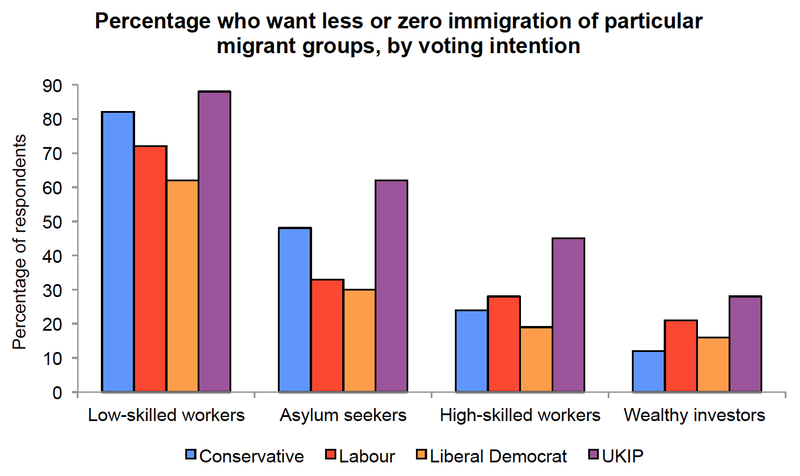 First, quite unsurprisingly, UKIP supporters are uniformly the most opposed to immigration, while Lib Dem supporters are generally the most supportive. And second, opposition varies substantially by migrant group. Respondents are most opposed to the immigration of low-skilled workers, and are least opposed to the immigration of high-skilled workers and wealthy investors. Indeed, a majority of every party's supporters want less immigration of low-skilled workers, yet a majority of every party's supporters also want the same or more immigration of high-skilled workers and wealthy investors.